Tracy is an associate in our Business Litigation Team. Her primary areas of practice are Civil Litigation, Business Litigation, Credit Recovery and Construction Litigation. Tracy acts regularly for companies and individuals on contract disputes, tort claims, lien actions and collections matters. 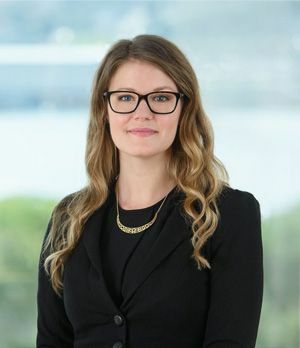 Tracy currently sits as BOYNECLARKE's Chair of the Associates and has appeared before the Supreme Court of Nova Scotia, the Small Claims Court, the Nova Scotia Utility and Review Board, and the Residential Tenancies Board. Tracy also has experience in alternative dispute resolution including, but not limited to, involvement with complex construction arbitrations. Tracy is an avid traveler. Prior to attending law school, she interned with the Judicial Service in Ghana, West Africa. Through this internship she authored the monograph titled Judicial Reform and its Impact on the Administration of Justice, published by The Judicial Service of Ghana in collaboration with CUSO and the National Judicial Institute. While at Dalhousie she also completed an academic exchange term at the National University of Singapore, Singapore. Judicial Reform and its Impact on the Administration of Justice, published by The Judicial Service of Ghana in collaboration with CUSO and the National Judicial Institute.